On the way to building a Gravatar app, we noticed that taking pictures of ourselves to update our Gravatars was something we only wanted to do every month or so, but then we started taking selfies and sharing them with each other and that became a daily and very fun habit. So our Gravatar app morphed into a Selfies app, and it’s now ready for the world to play with! You can read more about the app here. We hope you become one of the first brave souls to try it out, and let us know what you think. March 13, 2014 | Posted by Joen A. We just made the Gravatar.com website, blog, and all profile pages friendlier towards mobile devices. Additionally, you can now edit your profile on the go. 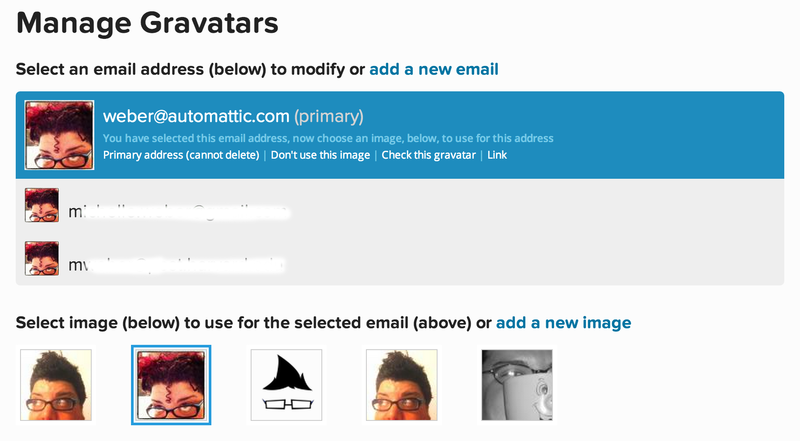 Did you know that you can have multiple email addresses associated with your Gravatar account? And that each email address can use a different image? 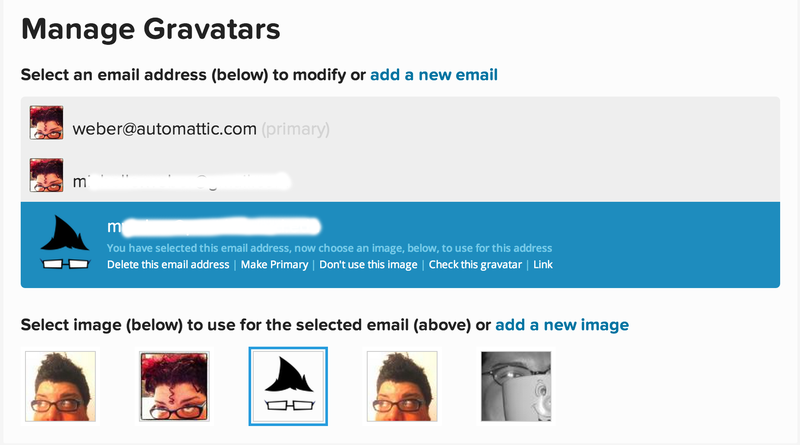 Managing multiple email addresses with Gravatar is a snap. Many of us have multiple email accounts — for work, school, our personal lives, our blogs, online groups we belong to, and more. Many of us also use different images of ourselves on different websites. You might not want your professional image to be the same as what you’d use on Twitter or Facebook. Make sure you use this email address when participating online, and the appropriate Gravatar will appear alongside. Now, your online identities are neatly separated, and you’re presenting yourself exactly as you prefer. 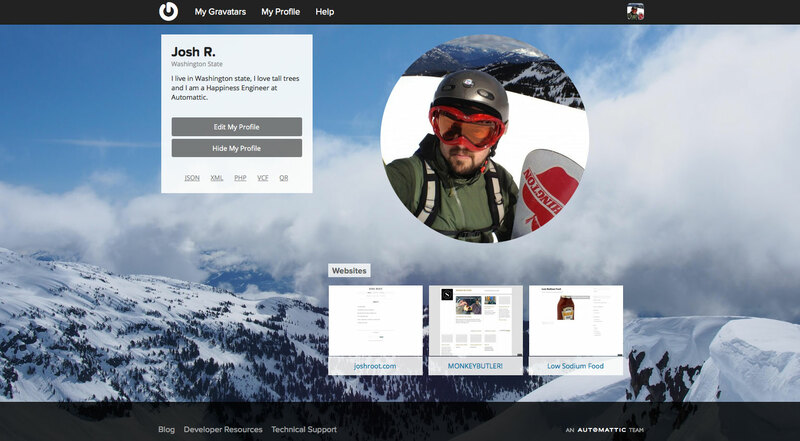 October 02, 2013 | Posted by Josh R.
Now we’ve made it easy for you to promote your WordPress sites on your Gravatar Profile. You’ve always been able to add your WordPress sites manually, just as you can with any other existing web page. In addition, now we also also display a handy list of your WordPress.com and Jetpack-connected sites from which you can select. Simply log into your Gravatar account and follow the instructions on the “How to Add websites to Your Gravatar Profile” support page. Once you’ve done so, you will see thumbnails of your chosen WordPress.com sites on your Gravatar profile. We’ve written about Gravatar Hovercards before — the nifty pop-up that adds a name, bio, and link to more info when you hover over a Gravatar on WordPress.com. Hovercards are a great way to learn more about the people commenting on your site, and to share your own contact info. But what about all the self-hosted WordPress sites? Are you stuck with simplified Gravatars if you’re not using WordPress.com? Not if you have Jetpack installed! Jetpack is a powerful, multipurpose plugin brought to you by Automattic, the same great folks behind WordPress.com and Gravatar. It’s a single plugin that hooks into the power of the WordPress.com cloud to bring you dozens of features for which you’d normally need dozens of individual plugins: social sharing, robust stats, proofreading tools, extra sidebar widgets, photo galleries and carousels, contact forms, image optimization, and more — like Gravatar Hovercards. Just install Jetpack and make sure the Gravatar Hovercards module is enabled to give your site visitors the tools to create deeper connections. We can’t really call Gravatars “globally recognized avatars” unless they’re realistically available to people the world over, and that means making sure everyone who wants to use one has language access. That’s why Gravatar, like every Automattic joint, relies on a fantastic group of international volunteers to translate almost everything we create, ensuring that what we do is globally accessible. In the past few weeks, we’ve completed the French and Korean translations of en.gravatar.com, bringing the total number of available languages to 43, from Georgian to Norwegian to Bengali. If you visit any of the non-English Gravatar pages, you might still see some content in English — that’s because almost all these pages are works-in-progress. If you’d like to contribute to one of them, or start a translation for a language that’s not currently on the list, we’d love to have you! Just click on “help translate” next to any of the currently available languages, or visit the Gravatar GlotPress page to see exactly what still needs to be done, learn how to become a translator, and add your language to the list. Last week we made some changes to how default images, sometimes called “fallback images”, are handled in Gravatar URLs. The purpose of these changes was to enhance the security of the Gravatar API and protect the many of millions of users who view billions of Gravatars every day. The majority of you will not notice any change – which is good! If you’re a developer though, you should keep these recent updates in mind. Default images must be publicly accessible via a simple HTTP or HTTPS request on the standard ports of 80 and 443, respectively. They must have a valid image file extension of jpg, jpeg, png, or gif. If your default image is not publicly accessible, doesn’t have a file extension, is not actually an image, requires HTTP Authentication, or is otherwise unavailable to a normal web request, it cannot be used as the fallback/default image for a Gravatar. On the backend, we are now processing default images through a new service we have been working on called Photon, which we will talk more about soon. We’ve also introduced a new default image which you can use, called ‘blank’. Just use ?d=blank and you’ll get a transparent PNG image in whatever size you asked for if the requested Gravatar doesn’t exist. More details on this are on the image implementation page as well. Now that all of Gravatar.com is optimized for retina display, you’ll be looking extra sharp to anyone who views your Gravatar profile or Hovercard from a device like the iPhone 4. But are you looking your best? 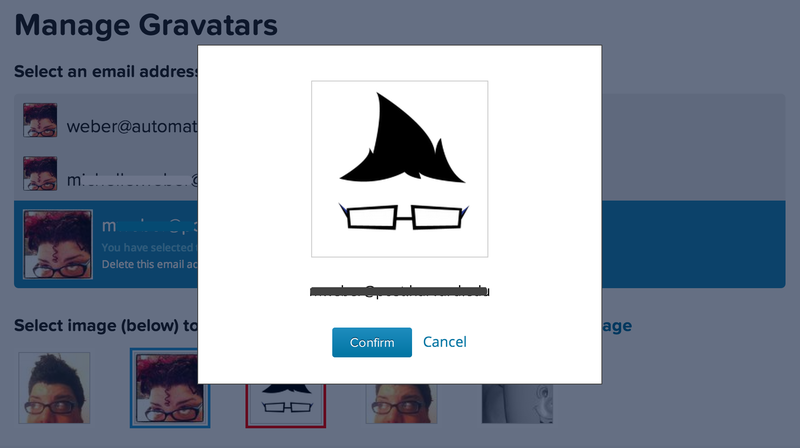 If you’re using a low-resolution image of yourself that you cropped from a friend’s Facebook photo two years ago, then it’s time for an update 🙂 Log in to Gravatar.com and upload a new image now, so that you can get a full-resolution version at all sizes, on all sites. If you’re one of the many sites that uses Gravatars, you’ll also be happy to know that we’ve increased the maximum size image you can request, all the way up to 2048px! That means you can go ahead and implement higher resolution user images for all devices, high-dpi or otherwise. We’d love to hear about any Retina-compatible implementations of Gravatar in the comments.